en days after the municipally blessed relaunch of electric standup scooter rentals in San Francisco, riders are rambling all over town on machines provided by the two companies that got operating permits from the city: Scoot and Skip. The permits, granted by the San Francisco Municipal Transportation Agency, give the companies permission to deploy 625 scooters each as part of a 12-month pilot program. If the launch goes well, Skip and Scoot could double their fleets in six months. That sounds nice and neat and, well, resolved. But not all is settled in the city's scooter wars, touched off last March when scooter firms Lime, Bird and Spin distributed their machines without city authorization. While the scooter pilot has launched, transportation officials are still facing a series of appeals from three companies questioning the city's process in awarding the permits. One of the companies has gone further, filing a lawsuit that resulted in SFMTA Director of Transportation Ed Reiskin and a member of the agency board being compelled to give depositions about the permit process. That happened Friday. Amid widespread complaints about the Bird, Lime and Spin scooters last spring, the SFMTA drew up regulations and decided on the format of the scooter pilot program. Bird, Spin and Lime were forced to pull their scooters off the streets and get in line with other firms that wanted to operate in the city. A total of a dozen firms eventually applied for pilot program permits. The SFMTA announced at the end of August that it was awarding just two permits, to Skip and Scoot, explaining the firms had scored highest among the 12 applicants. But Lime and two other companies that were shut out of the pilot program by the SFMTA -- Jump and Spin -- have not gone quietly. Each has appealed the agency's decision and are awaiting hearings in the coming weeks. The appeals are trying different tacks in trying to get the SFMTA to reconsider its permit decision. For instance, Jump -- an Uber-owned company known for its bright red electrically boosted dockless rental bikes -- raises questions about how permit applications were assessed and why the firm didn't score higher. The company's appeal letter ends with a rather restrained request for the city to grant more permits and allow an increase in the number of scooters on the street. Lime has taken a harder line. Lime argued in its September appeal letter that SFMTA officials and the application process led to an arbitrary decision to reject Lime's permit application. Earlier this month, days before Skip and Scoot were scheduled to launch, the company upped the ante. It filed a lawsuit alleging that the permit process was "cloaked ... in a veil of secrecy," lacked clear guidelines and was so biased it denied the company of its constitutional right to due process. The suit argues, in essence, that the transportation agency had it in for Lime and the two other companies that launched in March. The company's complaint points to a provision added to the city's new scooter regulations when the SFMTA board adopted the rules at a meeting in early May. Before they voted, several members of the board and audience said they felt the prior behavior of scooter operators ought to be considered in weighing future applications. That was a not-so-veiled reference to Bird, Spin and Lime, which had already been grilled before the Board of Supervisors and had gotten cease-and-desist letters from the city attorney's office. The most pointed comment at the meeting -- which Lime quotes in its suit as evidence of the SFMTA's prejudice -- came from SFMTA board member Art Torres. "These people are bad actors, number one," Torres said, noting Santa Monica's struggle to rein in Bird in late 2017. "... So I guess it goes back to what we said earlier about past behavior. We ought not be rewarding people who have stuck their fingers at us when dealing with cease-and-desist orders. Those of us on this panel, I know we believe in the rule of law. What are we going to do? 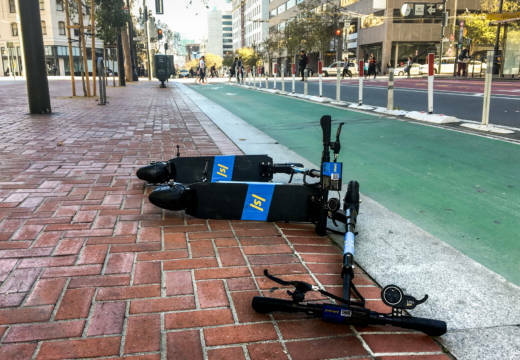 ..."
San Francisco Superior Court Judge Harold Kahn rejected the company's motion for a temporary restraining order that would block renewed scooter service to begin in the city Oct. 15. But Kahn surprised the city by giving Lime something the company's suit had not asked for: He issued an order allowing the company to seek further information from the SFMTA about its permit deliberations. As part of that evidence discovery process, the city initially agreed to let Lime take depositions from five SFMTA officials, including agency chief Reiskin. Upon further consideration, though, the city balked, and filed a motion asking Judge Kahn to reconsider his discovery order. The city's argument: California law does not allow courts to order the questioning of government officials about their decisions to grant or deny permits. Those depositions were scheduled to be taken Friday in San Francisco. Whether the testimony will help Lime's case or not likely won't be known until the next scheduled hearing in the case in mid-November.